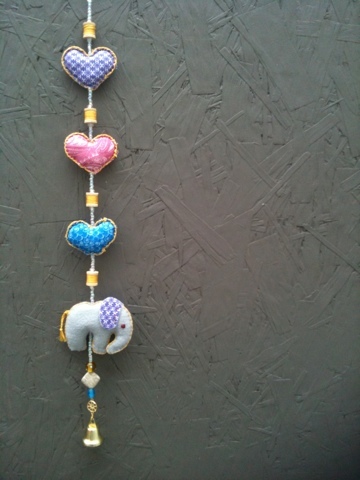 "Patience" the Elephant, a string of hearts, mini spools of thread, love and creative blessings sewn into every stitch...and the finishing touch, a muse bell. My childhood friend and creative ally, Casey Duvall, has a new blog and a new creative space that I just have to share with you! Check out her one-of-a-kind creations at Quilted Elephant Clothing Designs. This string of inspiration will be traveling to her new sewing studio, where it will adorn her walls and serve as her very own muse bell. She can ring the bell to summon her muse whenever she's ready to get down to the work she does best. As Picasso said, "Inspiration exists, but it has to find you working." I agree, we must not sit around and wait for inspiration to find us. We must show up and begin our work. But it doesn't hurt to make a little noise to let our muse know we're ready for a visit. (In case she's napping.) Ringing my muse bell is becoming a special part of my ritual for preparing my creative space for play. 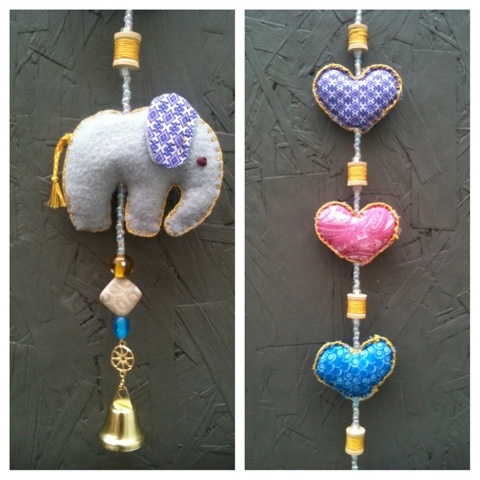 Find a pattern for the cute elephant plush and notes on my creative process throughout this project here, here and here.